BEIJING, April 30 (Xinhua) -- Beijing conducted a big marathon relay to mark the 100-day countdown of the coming Olympic Games here on Wednesday. 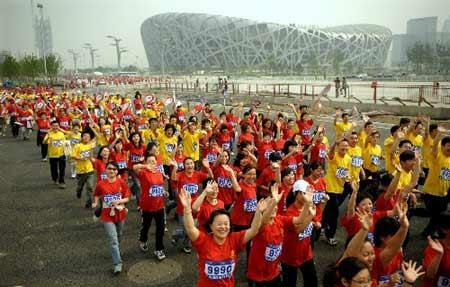 Some 1,000 runners, most of which Beijing citizens from different districts and counties, took part in the 31.5 kilometers relay, which starts from the west public area of the national stadium and also ends at the "Bird's Nest". About 10,000 people showed their support and welcome for the Beijing Olympics by attending a series of celebrating programs including the marathon relay, a 2 kilometers run and a public sports exhibition. Chinese traditional shadow boxing were performed at the Olympic Green by 2,000 fervent people, and various of Chinese dancing and acrobatics were also shown at the scene.